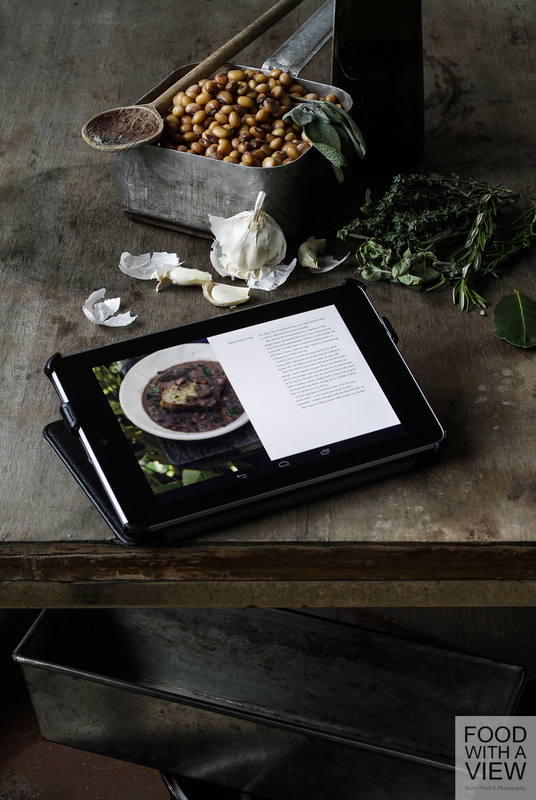 There are cookbooks that you need to work through and then fall in love with. And there are cookbooks that you fall in love with and then work through and then fall in love with even more. Elizabeth David on Vegetables which is available as of today, is a book of the latter kind. I have been kindly provided with an electronic review copy by London-based Quadrille Publishing – thanks a lot to the most friendly team over there – and I am most happy that by browsing through the recipes which have been wonderfully compiled by Jill Norman and most beautifully photographed by Kirstin Perers, I made the acquaintance of a remarkable cook, food writer and woman alike. To tell this from the start: I am a total newbie to the Elizabeth David universe, and after having done some research on her, I have no idea how I could manage not to know her oeuvre. Be that as it may: I am now fully aware that the book that I had marveled at on the occasion of my visit at Frankfurt Bookfair 2013 is not just another most beautifully photographed vegetarian cookbook, but a homage to a person who dedicated her life to really good food (and who really loved vegetables without being a vegetarian). Reasons enough for me to prepare as much of Miss David’s mostly Mediterranean treats as I could manage within one week. 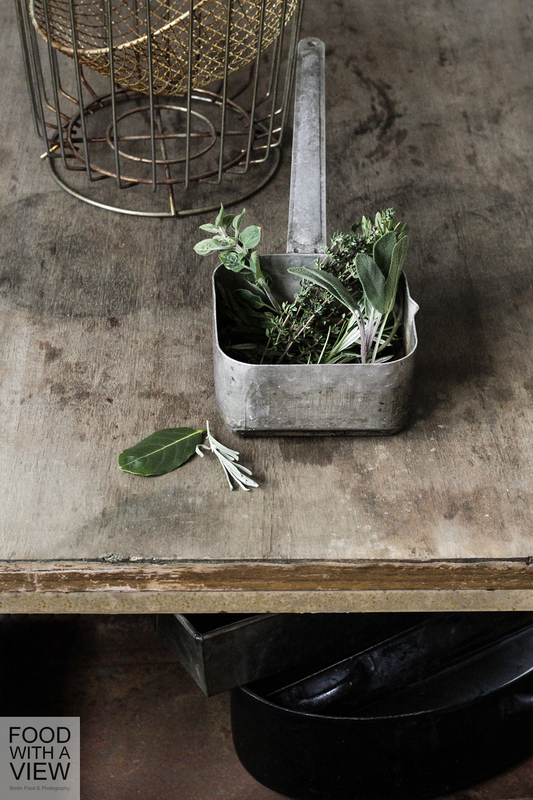 During this short journey, I to get impressed by the sophistication of her reduced, yet passionate cookery – which inspired me to capture the beauty of simplicity in a little photo essay in the recipe chapter of this post. Although this is a cookbook review (my first ever, by the way, I am most excited about it…), let me tell a bit about the person behind first – just in case that I am not the only blogger in the world who has not been familiar with Elizabeth Davids work so far ;-). All told, Elizabeth David has done for British cuisine what Julia Child did for U.S. cookery. They were born at the same time – the former in 1913 and the latter in 1912 – and both of them became cookbook authors as a second career during a time when even a first career had been unusual for women. But while Julia had a strong focus on French treats, Elizabeth’s obsession had been extended to Mediterranean cookery which had been unknown by then in the U.K. (and in Germany alike, by the way). In the 1970ies, she also turned to authentic British cuisine. Elizabeth has lived for quite some time in the countries that she wrote about, namely France, Italy, Greece, and Egypt (she had also lived in India, but as far as I know, she didn’t do any food writing about it). Her live has not just been about cooking: she had been an artist and an actress, and she had run a library in Cairo before she became one of the most influential British cookbook and food writers since the 1950ies. She had a passion not just for food and cookery but seemingly also for wonderful descriptions of both. Elizabeth David on Vegetables contains many of them, on ingredienst and places, and due to her elegant writing and close examination, they are as much worth reading as the recipes. Read more about Elizabeth David at Quadrille Publishing (and find the book here) or at Wikipedia. Picture taken from “Elizabeth David on Vegetables”, kindly provided by Quadrille Publishing; All rights reserved. 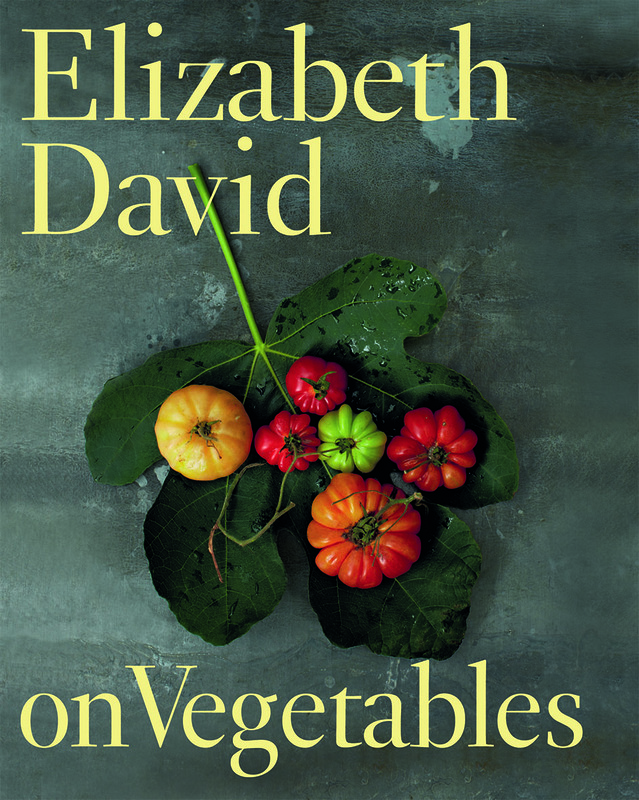 Published on the occasion of the author’s birthday’s centenary, Elizabeth David on Vegetables is a compilation of vegetarian recipes taken from all of her books. It’s not by coincidence that it focuses on vegetables since Elizabeth had loved them a lot (at least that’s what I learned about her in the meantime). 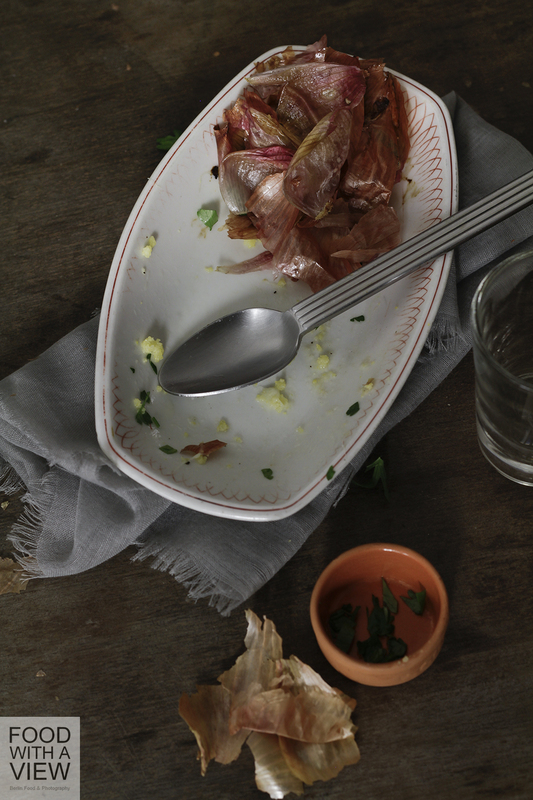 It’s all about good food, mainly from France and the Mediterraneans, about fresh products, and about authenticity. That’s all nothing new in today’s world of food & gourmet publications, isn’t it. But it has been a revolution back in her times, it’s always and still in fashion for very good reasons and it looks so damn good in this book. Indeed, when it comes to cookbooks, I often judge a book by its cover, and Kirstin Perers has done a most lovely job to show off Elizabeth David’s vegetarian legacy. However, eye candy would be nothing without seducing recipes – and interestingly, the temptation of David’s cookery is based upon the things she cuts out as she fully trusts on the purity of high quality product’s flavors. Admittedly, I had to keep my hands off a little something here and there in order to pimp a treat that sounded a bit too simple to me at first sight, but I stuck to Elizabeth’s rules and just cooked my leek with a glass of red wine and „very few salt“ and nothing else. 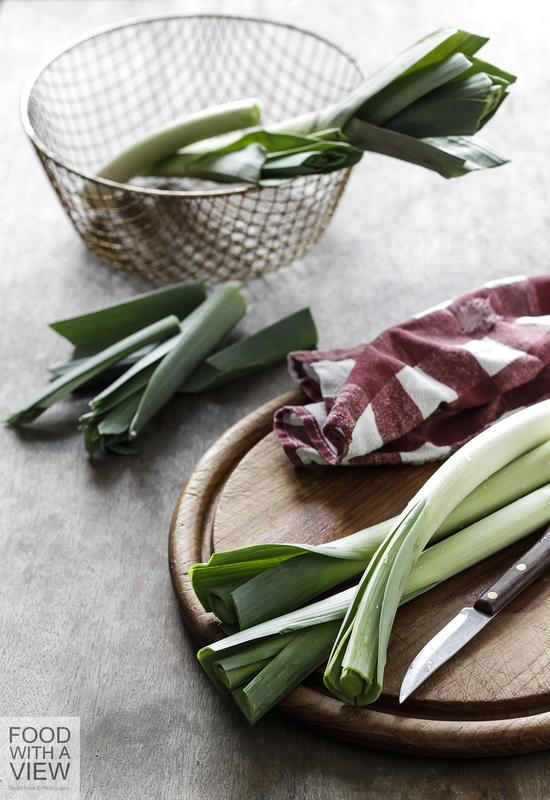 It had been delicious, as well as many other dishes in the book – some of them as plain as the leeks and some more complex, however none of them complicated or posh. It’s authentic, in one word. But do you need a cookbook for the experience that in cookery it’s often adding by substracting? Absolutely yes! Not so only for the reminder how easy live can be when there’s not twenty different herbs on the window sill and ten sorts of vinegar on the cupboard. But also for the bigger picture of a foodie’s mind that emerges page by page, especially within those beautiful little essays in between the chapters, where Elizabeth tells about some fine ingredients and beautiful places she had visited. Apart form the fact that I obviously like this book a lot, here’s some hard facts: It is divided into eight chapters – from Soup, Small dishes and Salads to Pasta, gnocchi & polenta, Rice bean & lentils, Main dishes, and finally Bread and Desserts, the latter two of which are quite short (and feature some of the very few non-Mediterranean recipes in the book). You will find a range of classic dishes like Ratatouille, Pesto, Ravioli Caprese, Mayorquina, and Pilau, but you will also discover delicious new treats. Quite often, the recipes come along with some information about their origins or about the people who handed them over to Elizabeth, giving you a feeling of looking into the pots and pans of real people like Antonio, Giulia and many more, some of them being writers, some cooks, and some housewives. The recipes themselves are described in brief, yet comprehensible; measurements are indicated both in metric and Anglo-American system – lucky me, as I always struggle with the latter in respective cookbooks and blogs. Sometimes, you find a list of ingredients on top of the recipes, sometimes it’s integrated into the text – just like in the respective originals. I would have loved by the way to find some editorial hints underneath each recipe which book it had been taken from – this would have added nicely to the feeling to hold a life’s work in your hands. A beautiful touch of patina comes along here and there in some remarks, such as that the French „unexpectedly“ use red rather than white wine in the cooking of leaks – an experience that is so common to us today that it wouldn’t be worth mentioning, as well as some information where to get Fontina cheese. I love to be thus reminded that common knowledge about the immense variety of foreign local cuisines and products has not always been so widely spread and that we owe it to women like Elizabeth David that we know and practice so much of it today. All told, Elizabeth David on Vegetables is (mostly) French and Mediterranean cookery seen through the eyes of one of its most early and prolific British ambassadors – surely a must-have for her fans and a most lovely first insight for those who love vegetables and don’t know Elizabeth yet. I mean, a woman who reflects on garlic presses as „utterly useless“ things has done something right, hasn’t she ;-). I made my choice from different chapters – mainly Soups, Small dishes, Pasta, gnocchi & polenta – and of course, I chose recipes that fit the season. 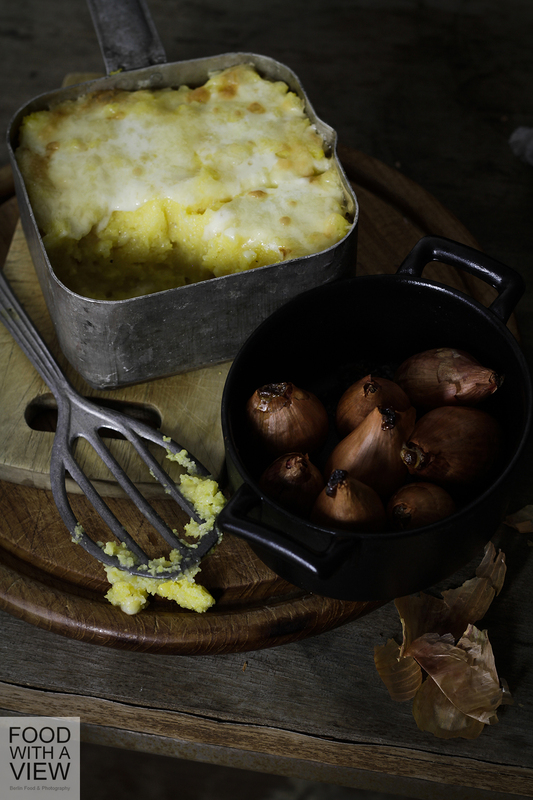 I started with Polenta grassa (Rich polenta) that I served along with Oignons rôtis au four (Roast onions). Oh my goodness… I was skeptical whether some nearly unseasoned (apart from salt) and quite stiff polenta would work in an oven-baked casserole dish, but the Fontina cheese and butter filling infused the whole treat so heavenly that I couldn’t stop to sigh with pleasure. My choice to let some oven-baked onions (me: shallots) join in had been perfect – a true match of creaminess and sweet as well as savory flavors, subtle and rich. Both recipe’s instructions and measurements worked perfectly. 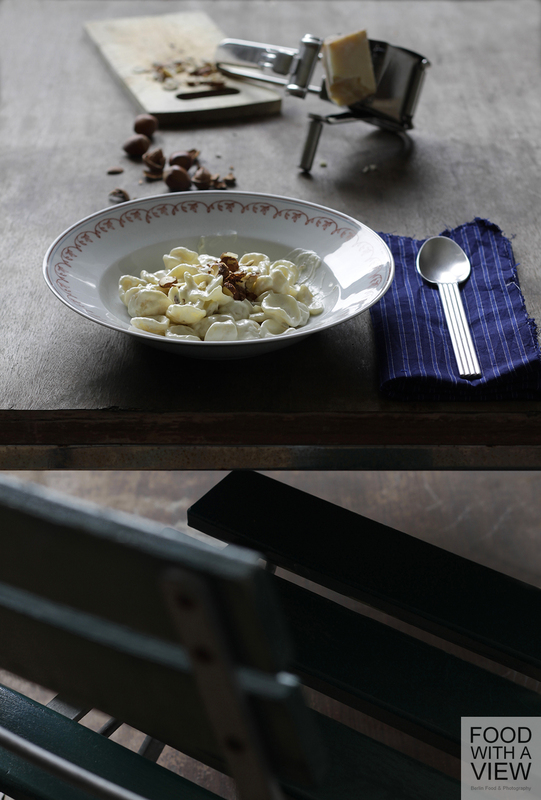 Next day saw us having Chiocciole al mascarpone e noce (Pasta shells with cream, cheese and walnuts), the latter of which I substituted with hazelnuts as I had so much of them at hands. The recipe indicated no salt, and again I was not sure what to think about it. I had provided me with best mascarpone and parmigiano and wonderful orecchiette (I couldn’t get chiocciole at the Italian shop) from Napoli which have been made with a special bronze drawing plate, and what can I say: the dish was so simple, yet so perfectly balanced with the slightly herb nuts and the cream & cheese sauce. 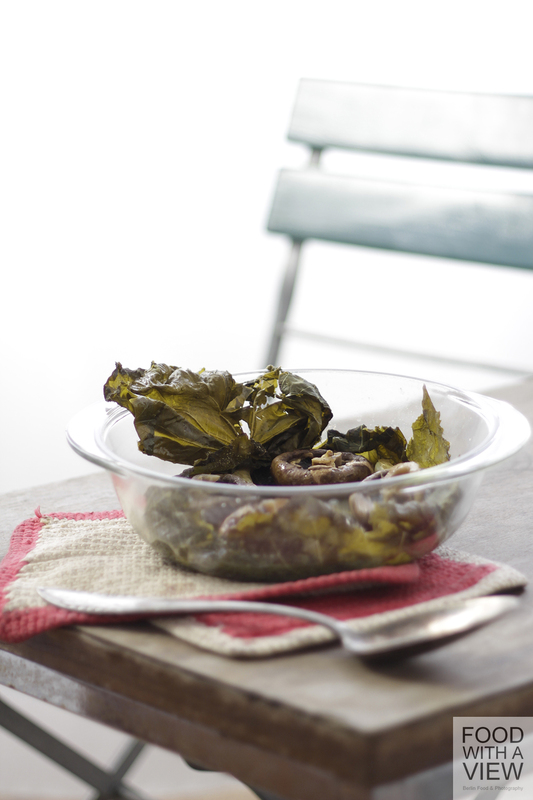 High time to turn to less filling treats: Poireaux au vin rouge (Leeks with red wine) has been my choice which had been followed next day by mushrooms cooked in vine leaves. 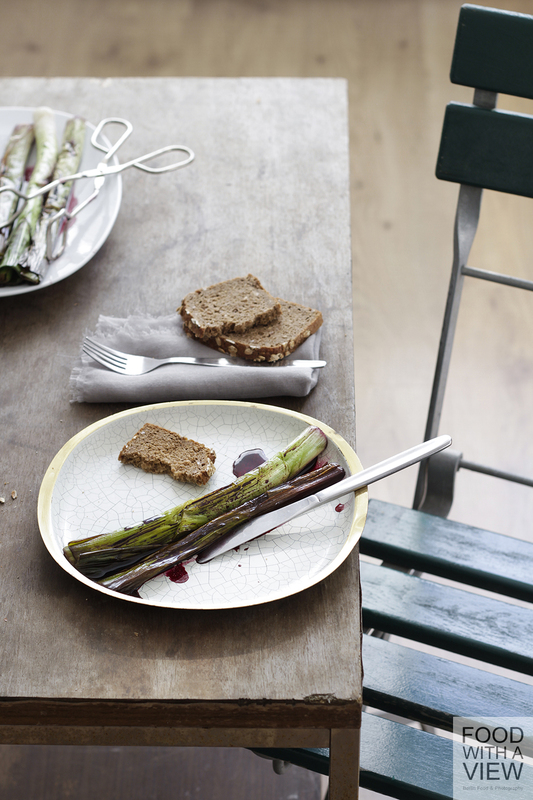 It has both been a true and pure vegetable’s hit. The liquid measurement „one glass of wine“ in the former recipe has not been too precise, and it took me a bit longer than „a few seconds“ to reduce it to a nice texture that could be served along with the leeks. It had been overwhelmingly delicious nevertheless with a deep aroma, and so were the mushrooms. Both will surely make a wonderful side dish with Galette de pommes de terre, a recipe from the book which I haven’t tried yet. 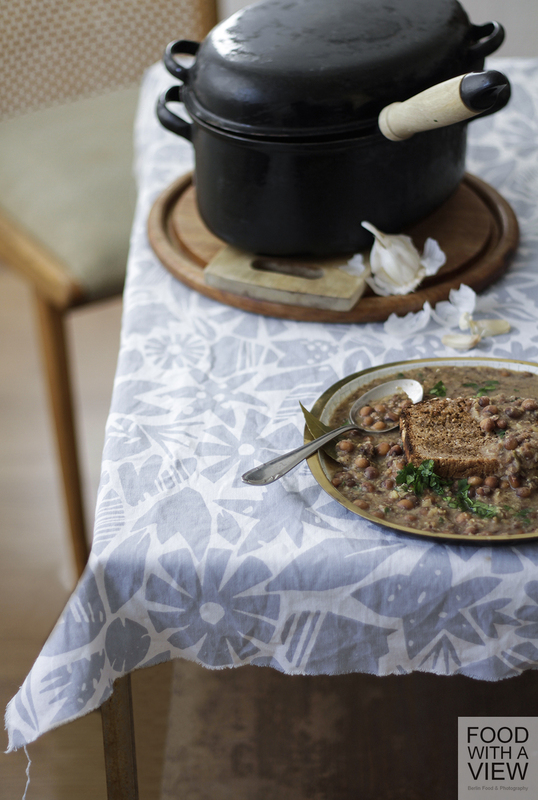 Tuscan bean soup had been the last on my list – a warmly flavored treat with some roasted bread infused with garlic and olive oil as an inlay, and again a dish with so simple seasoning, yet appealing. Elizabeth had proposed savory instead of sage which according to her is originally used in Tuscany (she thinks it’s too strong, and indeed I couldn’t find any sage in one of her other recipes either). As I had both at hands in a bundle of fresh Provence herbs, I took them all, but there would have been no need to do so – it’s the bay leaves and the flavored bread that make the dish already perfect (however I will try a version with fried sage next time – not the least, many of the recipes in the book are a wonderful invitation to try your own twist). Last but not least, there have been Uova mollette con funghi e formaggio (Eggs with mushrooms and cheese) on our plates. You can tell from the ingredients already, that this is a perfect composition for autumn season, elegant and – did I mention this already – pure. 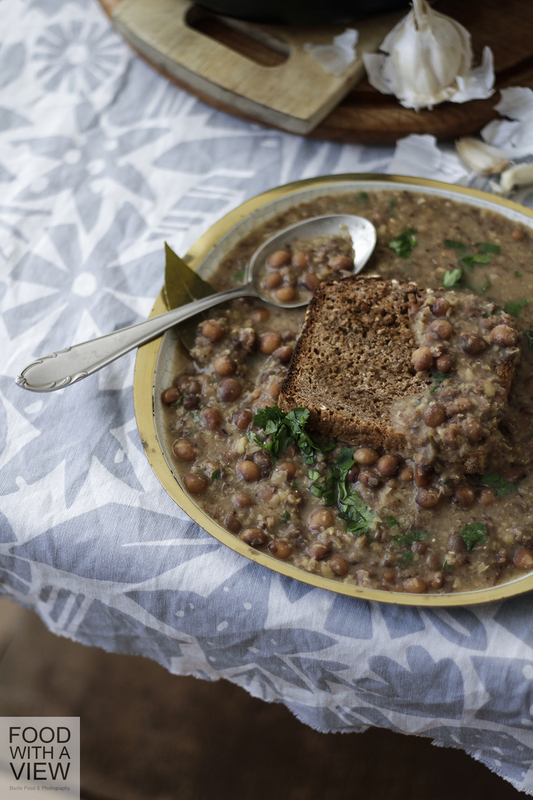 On my list for further enthusiastic cooking and baking are Irish wholemeal soda bread, budino di ricotta, the whole Small dishes chapter, gâteaux au chocolat et aux amandes, Mayorquina, and many, many more… Can’t wait to try them! Ich habe ja stets Probleme, der Überschrift der deutschsprachigen Rubrik auf diesem Blog Ehre zu machen, und diesmal wird das gar nicht klappen. Denn ich bin entzückt von diesem Buch. Es heißt Elizabeth David on Vegetables und erscheint heute im Londoner Quadrille-Verlag. Anlass für diese Hommage an eine Autorin, die ab den 1950er Jahren die englische Küche mit ihren mediterran inspirierten Kochbüchern revolutioniert hat, ist deren 100. Geburtstag – den sie freilich nicht mehr erlebt, das Buch erscheint also posthum. Ich gestehe, dass ich von Elizabeth David noch nie gehört hatte, bis ich dieses Buch in der Halle für internationale Verlage während meines Besuches auf der Frankfurter Buchmesse entdeckt hatte. Mit fliegenden Fingern bat ich den Verlag per E-Mail um ein Rezensions-Exemplar, denn Titel, Cover und die ganze wunderschöne Aufmachung des Buchs hatten mich elektrisiert. Don’t judge a book by it’s cover – dieses Sprichwort gilt für mich so gar nicht, wenn es um Kochbücher geht, dafür hege ich eine zu große Leidenschaft für schöne Food-Fotografie. 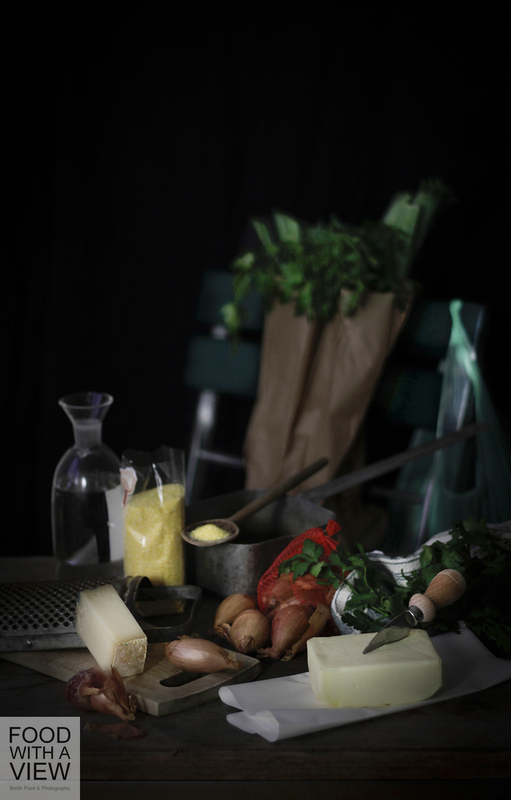 Ein Kochbuch ist für mich daher auch ein Bilderbuch, und in dieser Hinsicht hat die Fotografin Kirstin Perers ganze Arbeit geleistet. Aber das Kompliment für ein gut gemachtes Buch geht auch an die Herausgeberin Jill Norman, die die Rezepte einer leidenschaftlichen Köchin aus all ihren Büchern zusammengestellt hat und sie zwischen den einzelnen Kapiteln in Essays über besondere Orte und Zutaten auch selbst auf wunderbare Weise zu Wort kommen lässt. Elizabeth David ist ganz nebenbei auch eine bemerkenswerte Frau gewesen. Geboren 1913 ist sie vor ihrer zweiten Karriere als Kochbuch- und Food-Autorin bereits ihren Weg als Schauspielerin, Künstlerin und Gründerin einer Bibliothek gegangen – und zwar zu einer Zeit, als für Frauen nicht einmal eine erste Karriere üblich war. Sie hat in England, Italien, Frankreich, Griechenland, Indien und Ägypten gelebt, um schließlich ab den 1950er Jahren das zu tun, was Julia Child 10 Jahre später in den USA tat: ein ganzes Dutzend Lanzen zu brechen für die gute Küche. Bei Julia ist diese wie bekannt französischer Provenienz, bei Elizabeth kommt vor allem die mediterrane Küche und später auch die authentisch britische Kochkunst hinzu. Soviel zur Autorin – wer mehr wissen möchte, kann sich – auf Englisch – auf ihrer Autoren-Seite beim VerlagQuadrille Publishing kundig machen (und dort auch alle Informationen zum Buch finden) oder bei Wikipedia nachlesen. Und nun endlich zum Buch! Den wunderschönen Look erwähnte ich bereits – doch an diesem vegetarischen Kochbuch einer Nicht-Vegetarierin mit großer Begeisterung für Gemüse & Co. ist noch mehr ganz toll. Oder vielmehr noch weniger. Das Wenige ist ja manchmal mehr – und ich habe selten aus einem Kochbuch gekocht, dass so sehr auf wenige, aber gute Zutaten vertraut und jeden Schnickschnack weglässt. Ich musste mir anfangs schwer auf die Finger klopfen, um den meist schlichten Rezepten nicht hier ein bisschen Balsamico oder Trüffelöl und dort etwas Langpfeffer und meinen aktuellen besten Freund Scamorza affumicata unterzujubeln, aber ich habe es nicht bereut. Die meisten mediterranen Küchen neigen ja mit ihren hervorragenden Grundprodukten ohnehin nicht zum Überkandidelten, sondern geben sich der gekonnten Schlichtheit hin. 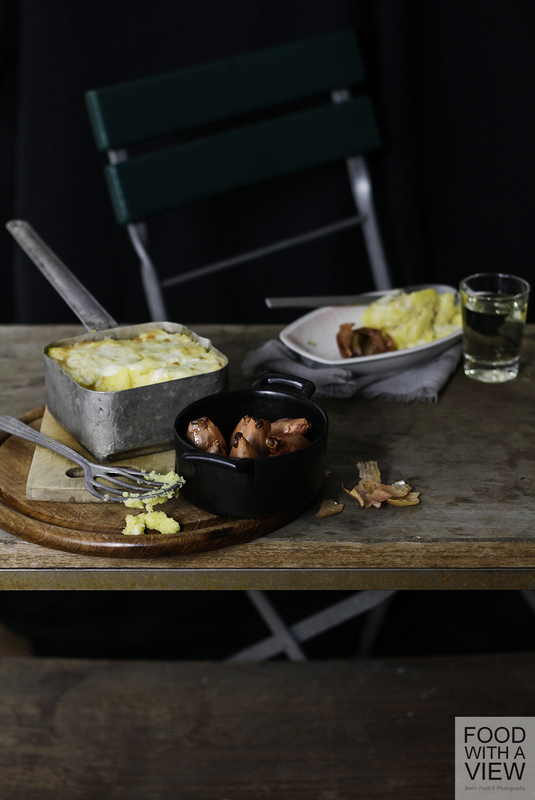 Elizabeth David mag es besonders schlicht – Lauch wird nur in Rotwein und Salz und sonst nichts gekocht, Polenta-Auflauf kommt mit Butter und Fontina aus, eine Pastinaken-Suppe wird mit nichts als Brühe, etwas Sahne, Kresse und in geklärter Butter gerösteten Croûtons zum Traum – wenn man den Rat der Köchin befolgt und die kleinen jungen Wurzeln verwendet und keinesfalls schält. Ihr in diesem Purismus ein wenig nachzueifern, gefällt mir momentan sehr gut. Aber braucht man ein Kochbuch, um zu der Erkenntnis zu gelangen, das weniger mehr sei? Ich finde: Ja, unbedingt! Jedenfalls in dieser Form, die auf so herrliche Weise auch ein bisschen Geschichte atmet. Denn an vielen Stellen spürt man den Geist der 1950er Jahre und nachfolgenden Jahrzehnte, die damals noch so neue und nicht bereits in gefühlte tausend Publikationen gegossene Aromen-Fülle des Südens. Man liest, dass man in Frankreich bemerkenswerterweise mit Rot- statt mit Weißwein koche. Dass Fontina gelegentlich in sehr gut sortierten Delikatessen-Geschäften zu haben sei. Aus heutiger Perspektive wirkt das rührend, aber es ist auch authentisch und zeigt, das die Fülle der kulinarischen Erfahrungen, mit denen wir heute in Europa leben, nicht immer so selbstverständlich war. In dieser Neuerscheinung steckt damit nicht nur der gegenwärtige Trend zum Vegetarischen, zum Alltagstauglichen, Frischen und Saisonalen, sondern ein ganzes Leben rund um’s Kochen und Essen (und Reisen). Für mich daher eines der tollsten Kochbücher, die ich derzeit lese – in elektronischer Form, denn meinem Rezensions-Wunsch wurde vom Verlag mit einem PDF-Download entsprochen (fand ich super), der die das nun auf meinem Tablet wohnt. Im Handel ist das Buch aber natürlich als gedruckte Version, nur auf Englisch, aber – das freut mich sehr als umrechnungsfaule Köchin – sowohl mit metrischen als auch anglo-amerikanischen Mengenangaben. Zur Haptik und Optik kann ich nur sagen, was ich von der Messer her in Erinnerung habe: Es liegt gut in der Hand und ist hochwertig gestaltet. Aufgeteilt ist Elizabeth David on Vegetables in acht Kapitel – Suppen, Salate, kleine Gerichte, Pasta, Gnocchi & Polenta, Reis, Bohnen & Linsen, Hauptgerichte, Brot und Desserts, letztere beide sehr knapp gehalten. Man findet Klassiker wie Ratatouille, Pesto, Ravioli und dergleichen, aber auch sehr schöne weniger bekannte Gerichte. Zu vielen Rezepten erzählt die Autorin eine kurze Geschichte, woher das Rezept stammt oder von wem sie es bekam – so schaut man ein wenig Menschen wie Antionio und Giulia, manchem Schriftsteller, Koch, Köchin oder Hausfrauen über die Schulter und in die Töpfe. Die Rezepte sind kurz und verständlich beschrieben, manche werden mit einer Zutatenliste eingeleitet, manche beinhalten diese im Fließtext – jeweils so, wie sie im Original vorliegen. Schön hätte ich gefunden, wenn die Rezepte mit Notizen versehene worden wären, aus welchem von David’s Büchern sie stammen, weil dies den Eindruck noch unterstrichen hätte, ein Lebenswerk in Händen zu halten. Alles in allem der wunderbare – und im Rückblick des Lesers ein wenig nostalgische – Blick einer profilierten britischen Botschafterin der französischen und mediterranen Küche auf ebendiese, die sich ihrer Leidenschaft für wirklich gutes Essen und sehr gute Produkte mit schönen Beobachtungen und hübschen Pointen nähert. Für Fans mit Sicherheit ein Muss, für ein Einsteiger (bin ich die einzige?) suchtbildend. Und nun zu meinem Selbstversuch, eine Woche lang so viel aus diesem Buch zu kochen, wie mir das neben meiner derzeit knapp bemessenen Zeit möglich war. Die kleine Reise durch das Elizabeth-David-Universum hat mich zugleich zu einem kleinen Foto-Essay über die Schönheit des Schlichten inspiriert. Ich habe aus möglichst vielen Kapiteln solche Rezepte gewählt, die in die Jahreszeit passen – und solche, die sich relativ schnell zubereiten lassen. Wobei schnell bei Elizabeth David nicht nachlässig heißt, Gott bewahre. Ich belasse die Namen der Rezepte so, wie sie im Buch stehen, nämlich in den meisten Fällen in der Original-Sprache des Herkunftslandes und in englischer Übersetzung (sonst entsteht beim flüchtigen Drüberlesen der Eindruck, das Buch sei auch in deutscher Übersetzung zu haben, was (bislang?) nicht der Fall ist). Los ging es mit Polenta grassa (Rich polenta), die ich mit Oignons rôtis au four (Roast onions) kombiniert habe. Wahnsinn… Ich war ja skeptisch, ob eine an meinen Maßstäben gemessen recht feste Polenta-Masse, die zudem nur mit Salz gewürzt wird, in einem Auflauf genügend Charme entfalten würde. Die Fontina-Butter-Füllung hat alles gut nach Hause gebracht, und es war einfach nur köstlich (aber ein bisschen Pfeffer und Petersilie habe ich dazugemogelt). Die pur gebackenen Schalotten (statt Zwiebeln, die ich nicht vertrage) dazu schmeckten nur mit Butter und Salz so gut, dass ich geseufzt habe vor Vergnügen. 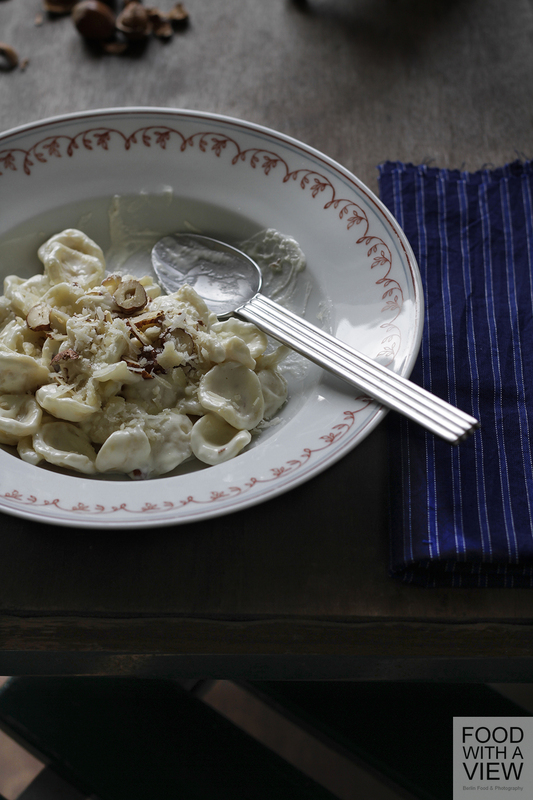 Weiter ging es mit Chiocciole al mascarpone e noce (Pasta shells with cream, cheese and walnuts). Die Walnüsse habe ich durch Haselnüsse ersetzt und ansonsten brav nur besten Mascarpone, Parmesan und – in Ermangelung von Chiocciole – feinste mit Bronze-Zieheisen hergestellte Orechiette aus Napoli zum Einsatz gebracht. Und das war gut so. Sehr gut sogar. Und das ganz ohne zusätzliches Salz. 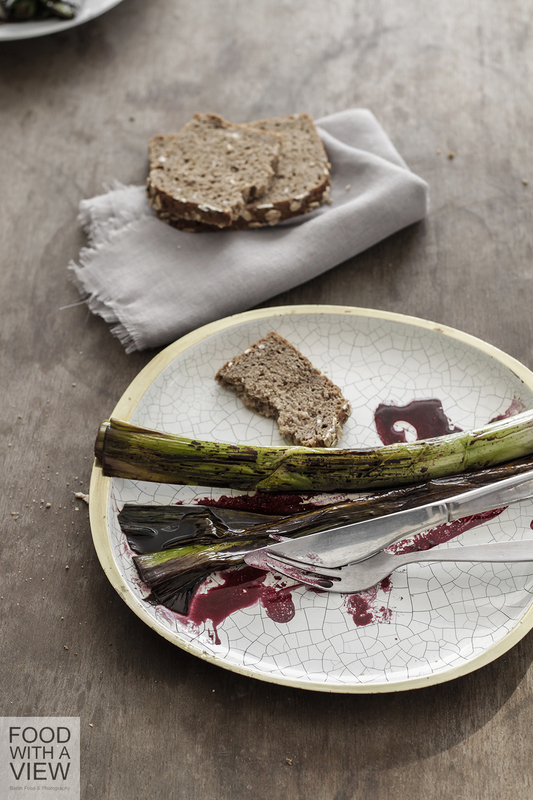 Etwas weniger magenfüllend kam nun Poireaux au vin rouge (Leeks with red wine) an die Reihe – mein Erstaunen, dass der Lauch mit nix als Rotwein und etwas Salz so schmeckt, als hätte man ihn unsagbar komplex und raffiniert vorbehandelt, hatte ich ja schon zum Ausdruck gebracht. Nur die Mengenangabe „ein Glas Wein“ war etwas vage, und so brauchte ich auch mehr als „ein paar Sekunden“, um ihn servierfähig zu reduzieren. Im Übrigen liegt die Finesse im Detail: Wenn die Autorin schreibt, man möge junge, kleine Stangen 20 Minuten kochen, dann ist das wörtlich zu nehmen – die ausgewachsene dicke Stange, die dazwischengeraten war, wäre auch nach der doppelten Zeit ein semi-gegartes Faser-Monster geblieben…. 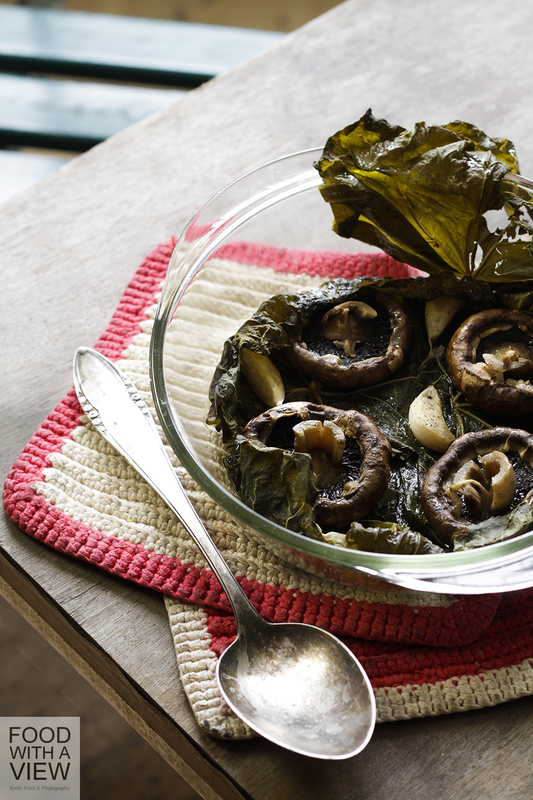 Und dann Mushrooms cooked in vine leaves, also Pilze in Weinblättern. David versprach, dass auf diese Weise, nur mit Zuhilfenahme von Weibblättern und Knoblauch, Zucht- wie Wiesenchampignons schmecken würden. Sie hat recht, es ist verblüffend. Sowohl der Rotwein-Lauch als auch die Pilze würden sich sicherlich wunderbar machen zu einer Galette de pommes de terre, die ich noch ausprobieren will. Zwischendrin gab es auch noch Uova mollette con funghi e formaggio (Eggs with mushrooms and cheese). Die haben es nicht vor meine Kamera geschafft, was sehr ungerecht ist, denn den wieder einmal sehr überschaubaren Zutaten kann man dennoch sofort ansehen, wie lecker ihre Synthese ist. Auf meiner Nachkoch- und Nachback-Liste stehen außerdem noch Soda-Brot, Budino di ricotta, das gesamte Kapitel Small dishes, Gâteaux au chocolat et aux amandes, Mayorquina und so vieles mehr… Aber bevor ich dazu komme, gibt es noch ein paar andere Rezensionen, namentlich indische vegetarische Küche, orientalische Snacks und Alpines… Und wenn ich damit in ferner Zeit fertig bin, denke ich mir dann auch mal wieder selbst etwas aus ;-). Wow! Ein Rezensionsfeuerwerk, Claudia! Und diese Fotos.unglaublich! Ich tapse zum Regal und schaue mal nach den Elisabeth David Classics….. Und das von Dir, Susanne, die Du so tolle Rezensionen schreibst – wie mich das freut, lieben Dank! Ich bin jetzt natürlich sehr gespannt, was Du in den Elizabeth David Classics so alles entdecken wirst :-). Ich liebe ihn auch sehr, den geräucherten Scamorza! 🙂 Und ich stimme dir ohne Einschränkung zu: weniger ist mehr. Mir fällt es auch immer unglaublich schwer, die Finger von kleinen “Erweiterungen” zu lassen, aber meist werde ich reichlich belohnt, wenn es mir gelingt. Danke für die wundervolle Rezension! Vielen lieben Dank, Eva! Und Du hast recht, es lohnt sich, einfach mal “einfachen” Anweisungen zu folgen und über das Ergebnis zu staunen – wenig Aufwand, große Wirkung. Lieben Gruß zurück! Lieben Dank, Julia! Wo ich von Dir auch schon so tolle Rezensionen gelesen habe, freut mich das sehr, dass ich Dich mit dieser auch inspirieren konnte. Es hat mir tatsächlich großen Spaß gemacht, mal streng nach Rezept zu kochen und dem einzelnen Lebensmittel viel Aufmerksamkeit zu widmen – das mache ich sonst auch, aber ich habe das jetzt mal richtig zelebriert und fand dieses Schlichte sehr inspirierend, auch für’s Fotografieren. Lieben Gruß zurück! Oh, lieben Dank, Claudia! Das freut mich wirklich sehr, dass Dir die Rezension und die Fotos so gut gefallen. Mit den Hülsenfrüchten (kleine brasilianische Bohnen, die in der Tat ein bisschen wie große Linsen aussehen) habe ich fotografisch tatsächlich schwer gerungen… Das Metall-Töpchen liebe ich auch heiß und innig – mein Liebster hingegegen nennt ihn “oller Pott” und mag ihn gar nicht, nicht zu fassen ;-). Lieben Gruß zurück!